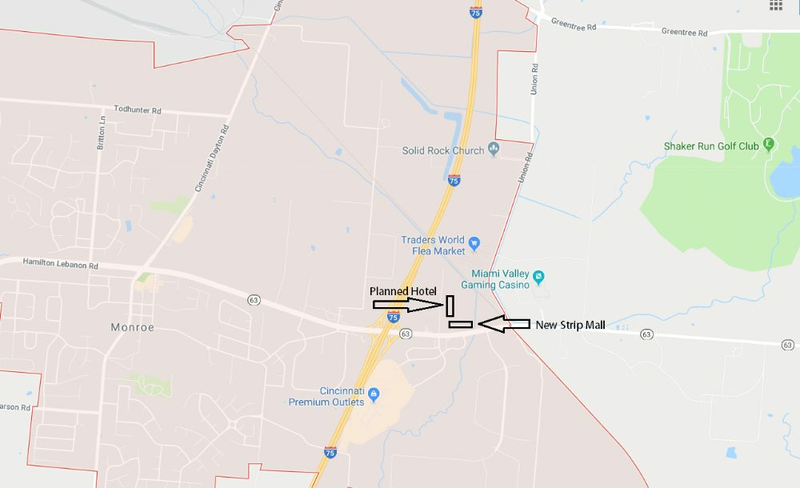 Cincinnati Commercial Contracting (CCC) plans to bring a new, limited-service or extended-stay hotel to the area just north of the corner of Ohio 63 and Senate Drive in Monroe, about a half-mile from Cincinnati Premium Outlets. The hotel, which will be either a Hilton, Marriott or a Holiday Inn Express, will be located behind CCC’s 11,000-square-foot retail strip center Retail 63, which broke ground earlier this year. The hotel is expected to open by spring 2020. Mason-based Crestpoint Companies will be the developer, owner and operator of the as-yet-to-be-named hotel. CCC will be its general contractor. The retail portion of the development so far is set to include a Penn Station with a drive-thru , as well as a nail salon. Other tenants have signed letters of intent for the remaining spaces, which constitute about 8,000 square feet of space, said John Westheimer, president of CCC. One of them will be a cellphone store, he said. So now Monroe will have both a DQ and a Penn Station!